Nowadays it is acknowledged that mountain forests play a number of roles for the utility of the community, both environmentally (ecology, landscaping, heritage) and socio-economically (production and physical protection). This awareness has been expressed notably in Resolution No. 4 of the December 1990 pan-European ministerial conference in Strasbourg, and in the “Mountain Forest” protocol registered in the Alpine Convention discussed in Salzburg in November 1991. The various functions assigned to mountain forests can be fulfilled only by guaranteeing appropriate management, which consists of a series of operations directed at preserving or improving the structure of forest crops. Such operations have both silvicultural and economic appeal; however, “in-the-red” cuts are being observed more and more: for these, what are considered to be essential silvicultural operations can be carried out only by very costly logging methods-or not at all. It seemed necessary to take a global approach to the management and harvesting of such mountain forest crops so as to determine the most rational ways to operate in order to allow these crops to fulfil their various functions. This article reports on a study carried out by French and Italian silvicultural and logging specialists, “Mountain forests: techniques for long-lasting, multifunctional management in the French and Italian Alps”1, involving experimental operations on six pilot sites (three in France and three in Italy). The study aimed at reaching the best possible compromise between silvicultural objectives and logging constraints for each site by pooling expertise in these disciplines among specialists from each country. The relationship between silviculture and logging on each site was identified by determining the physical, technical (silviculture, logging) and economic (cutting balance) constraints. First step: Identify the forest's main characteristics and its protective roles (determine both what is at stake and crop stability). Second step: Measure the potential technical and economic impact. Determine the type of silviculture that would be advantageous and the technical possibilities for logging. Third step: After determining the best silviculture/logging compromise for the specific context, carry out silvicultural and logging operations. Draw up a technical and financial statement (silviculture and logging costs) and summarize. 1 The study was carried out within the framework of LIFE Programme No. 94/F/A15/EU/00173, and brought together: for France, the CTBA (Technical Center for Wood and Furniture), the CEMAGREF in Grenoble, and the National Forestry Office (Interregional Technical Department and the Rhône-Alpes Regional Management Office): for Italy, the Istituto per l'Assestamento Forestale e per l'Alpicoltura (ISAFA, for silviculture) and the Istituto per la Technologia del Legno (ITL for logging techniques), both in Trento, and the Istituto per la Ricerca sul Legno (IRL, logging techniques) in Florence; and for Switzerland, contacts were mainly with the Federal Institute for Research on Forests, Snow and Landscape, in Birmensdorf. The sites were chosen in distinctly multifunctional forests with a major role in physical and landscape protection. These sites are generally located on steep slopes and are crossed by paths that pass near human activities. Except for the Boutat site (beech forest), they consist mostly of subalpine spruce forest. description of 25-are quadrats by means of a previously existing, appropriate typology (STIR-CEMAGREF) and mapping. analysing the elements at risk (homes, roads, etc.). recognizing rare flora or fauna (especially black grouse) that might justify specific precautions. Based on the above elements, a diagnosis was established for each site, defining ex ante optimal silvicultural prescriptions that were weighed against logging issues in order to reach a choice of logging methods that would result in the best economic balance as a function of the technical constraints. Trees were marked, sold and logged according to the projected cutting objectives. volume harvested (total and per hectare). description of the environment after logging. The main techno-economic indicators were determined for each type of material used in order to specify their operating limits. All sites are located in the northern Alps. The study of one of the three original sites, the Abondance Community Forest (Haute-Savoie), could not be completed for reasons discussed below. Another site was found in the Contamines-Montjoie Community Forest (Haute-Savoie) to replace it. This zone includes Compartment 7 and parts of Compartments 41, 42 and 43 of the State-owned Boutat Forest (Isère Department) located at the eastern edge of the Chartreuse massif. The study site, which abuts against the massif's Urgonian cliffs (200–300 m high), belongs to the acidicline calcicolous beech forest series (elevation from 1 100 to 1 500 m). It consists of a dense, high forest of medium-sized beech that affords efficient protection from rockfall from cliffs and somewhat less efficient avalanche protection. It is also located at the edge of the Chartreuse regional and national park, and has a landscaping role that is highly visible from the Isère Valley. Group 5. Sparse, all-aged, small-timber high forest (540 stems per hectare). To preserve both the landscape and the protective role of the stands, it is necessary to achieve greater irregularity in the stands by selectively thinning out clumps and opening up 5- to 20-are clearings. A total of 1 523 stems were marked for a total commercial volume of 819 m.
The cutting configuration (1 000 m wide and 500 m high) and the lack of a skid road on the slope called for the use of a mobile carrier cable system. The carrier cable made it possible to concentrate the hauling operations in three areas (14 ha) where the removal rate was higher than 200 m3 per hectare, the necessary minimum for cost-effective cable logging (since it was necessary to find a compromise between economic constraint and achieving greater irregularity). Five lines were marked out (each 400 m long). These made it possible to liberate the regeneration acquired in Group 4 by means of “finger” -shaped openings, and to carry out secondary cuttings of single trees in Group 3, as well as thinning and seed cuttings in gaps in Group 1. Within the framework of this programme, only Cable Lines 1 and 2, which correspond to the richest compartment, were installed and carefully studied. On these two lines, 396 m3 were logged. Less than 30 percent of worktime was actually productive, which is a fairly acceptable result for the technique used. The operation was well integrated on the whole, even if the snow accentuated the impact of the cable lines, making the “fingers” stand out. Logging operations were paid 35 Euro per cubic metre, including 17.5 Euro per cubic metre for yarding, and the wood was sold at 40 Euro per cubic metre - hence a 5 Euro benefit for the owner. But the time measurements show that they cost 64 Euro to the operator. This is partly because of mechanical, organizational and meteorological problems. With better conditions and limited costly interventions in the upper areas, it should be possible to cut these costs down to about 42 Euro, closer to the processed wood value (40 Euro). In the future, the State, as owner, will have to accept a slight deficit to ensure the maintenance of this protection forest, while enhancing the local economy. The Pralognan-la-Vanoise Community Forest (Savoie): the Isertan massif: Compartments 37, 39, 40. This zone is located in the valley of the Tarantaise, just outside the Vanoise National Park. It belongs to the subalpine mesotrophic spruce forest series (elevations between 1 450 and 1 750 m, north-by-northwest exposure). Before the 1968 and 1977 storms that ravaged it, the forest consisted mostly of a dense, even-aged spruce crop. Of this, only more or less complete clusters remain. Not only does the forest play a protective role against the avalanches and rockfall which endanger the multitude of tourist installations at Pralognan (both a winter ski resort and summer resort), but the zone's location along Pralognan's Doron Valley gives it considerable importance from a landscape point of view. It is also home to the Linnaea borealis L., a very rare plant species that is protected by the Alpine Convention. An analysis of the crop typology shows three distinct zones: a lower, more or less open zone of old-growth spruce, a multilayered middle zone that is more irregular, and an upper zone that is predominately even-aged medium-sized timber. Taken as a whole, the area is still rich in timber (300 m3 per hectare). It was decided to maintain complete crops by limiting any new openings smaller than 5–10 ares, find a better storey structure, and open up the crop to the light in areas where regeneration has taken hold. Four hundred and thirty-nine stems were marked for a total commercial volume of 820 m3. Given the impossibility of creating a road infrastructure, it was decided to haul by cable crane. Two cable lines were installed, one 580 m long, the other 920 m. They serve both edges of the study zone, but neglect the central area somewhat. For financial reasons, a third more central line could not be installed. The lines were traced out to make it possible both to open up slits in the medium-sized timber of the upper part and to make sanitation cutting in the large timber of the lower part. The two lines limit the impact on the cutting area's landscape for the highly tourist region (summer and winter). It is possible to log up to 50 m on either side of each line; 743 m3 were harvested. The high yields observed could be connected with the volume of the average tree felled and the total volume logged per line (223 m3 on Line 1 and 520 m3 on Line 2). Logging costs 45 Euro/m3 exclusive of tax, and the sale of harvested wood brought in 59 Euro/m3, or a substantial profit of 14 Euro/m3 exclusive of tax, for the district. The Contamines-Montjoie Community Forest (Haute-Savoie): Compartments 37 and 47. This zone is located right between the Mont Blanc and the Beaufortin massifs and covers the steep eastern slope of the narrow Bon Nant Valley. It belongs to the acidiphilous spruce forest series (elevation from 1 500 to 1 970 m) on slopes at gradients that vary from 50 to 70 percent. Sixty percent of its surface is covered with old-growth, even-aged high spruce forest. Since avalanche chutes cross the forest, it plays a very active protective role. Both in summer and in winter, the nearby Mont Blanc massif attracts a large number of tourists, who use both the extensive network of paths that also cross the forest and the ancient Roman road down below. The study site divides into three distinct zones: at elevations > 1 600 m, a sparse, high forest; first generation (< 100 years old) stands; and the largest zone consisting of even-aged high forest of old, dense (>250 m3 per hectare) trees, where regeneration is insufficient. The recommended operations are aimed at perpetuating the forest cover. This means liberating what little regeneration there is, initiating a natural renewal of species, maintaining the stability of dominant trees by thinning out clusters and by opening up lanes that are oblique to the slope (to avoid creating avalanche or rockfall chutes), and harvesting mature and old timber. Six hundred and fifteen stems were marked for a total commercial value of 1 397 m3. The original association of cable crane and skidding tractor was chosen. Theoretically, hauling could have been done using the ancient Roman road, but tractor access is prohibited on some sections of it. Therefore, the skidder was used only for skidding timber to within cable range and the cable crane took over above the road. The block standing sale of the harvested timber brought in 14 Euro per cubic metre for the district. For the company that bought it, the timber cost 11 Euro per cubic metre in felling charges and 30 Euro per cubic metre in hauling charges. For a value of the processed wood of 58–60 Euro per cubic metre, the operation is still profitable. The Abondance Community Forest (Haute Savoie): Compartments 16 and 57.84 percent of the trees have defects (wind, snow, and rock damage). According to the plan, the regeneration phase will begin with the logging of 3 500 m3 over the entire massif in the form of small group cuttings in mature stands and in the more multilayered southeastern area so that the whole zone benefits from each cutting operation. A total of 383 trees were marked for a total commercial volume of 1 070 m3. The decision to log by cable in two lines over a total of 2.5 ha was influenced by the shape of the plot, which is very long slope-wise and relatively far from the closest road. In practice, this involves clear-cutting in two strips, but with a careful trimming of the edges as a function of the cluster structure of the particular crop. Some clusters were maintained along the line, or even on the line, to break the gap effect. Very little damage was observed on trees and on the ground. The cutting was clearly beneficial for the community. Photographs taken after the cutting give a good indication of the landscaping success of what was a rather extreme operation, but which made good use of a favourable crop structure. The operation is reproducible over time, strip by strip, and over the entire plot. The Magnifica Comunità di Fiemme forest, in the Varena district, Palua-Malga Ora locality: Compartment 55 and parts of Compartments 54 and 56. This very open, gently sloped zone connects the Lavazè Pass and the Ocolini Pass (1 790–1 890 m). In the “combat area” of subalpine spruce forest, it consists largely of spruce stands (70–80 percent) and Cembra pine. The zone is located in a popular tourist area, and is an important part of it, notably for cross-country skiing. It also harbours animal life of some interest (ungulates and birds). Analysis of crop structure revealed two distinct zones: a pure, single-layered spruce stand, and a mixed spruce-Cembra pine crop. The major role of the site is recreational. The crop as a whole is relatively old and uniform (only 25 percent of total surface consists of single-tree mixture), in the form of small, homogeneous surfaces (3–4 ares maximum). Natural regeneration is very inadequate over more than 80 percent of the total surface. Trees were marked, based on the rare patches of regeneration that do exist. The renewal of very old trees was accelerated, and three openings were made. The cutting objective was to replace old timber and to initiate regeneration by increasing the amount of light reaching the ground without sacrificing the landscaping aspect. This was done by making small openings. A total of 162 stems were marked for a total commercial volume of 278 m3. Because the site is accessible and relatively flat, a wheeled tractor equipped with a cable could be used. These operations were highly beneficial for the community. It will be easy to extend them gradually to the entire plot, year by year. Ground damage is insignificant, although 20 percent of trees left standing were damaged by tractor logging. Of course, it will be a few years before we can evaluate the consequences of these operations as a whole on slope stability, and therefore on the protective role of these forests. However, we did note that operations on the Pralognan site did not have adverse effects on the crop. Shortly after logging, violent winds crossed the district without causing any windfall. On the whole, the landscape was correctly preserved, even at the Sadole site where the clear-cut marking could lead one to expect the worst at first sight: actually, the edge “treatment” completely blurred the visual impact. Snowfall at the Boutat site, just a few months after operations, did increase the visibility of the cable lines - but by spring, vegetation had concealed all the openings. The table below compares the logging results for each of the six sites. The balance sheet highlights the materiality of total cutting volume and average tree volume. Any other comparison is problematic, given the variety of the terrain, silvicultural approaches and techniques used. The highly cost-effective hauling by cable carrier at the Sadole site (linked to the cutting concentration. to be sure) is remarkable. In contrast, the mediocre results at the Boutat site illustrate the negative consequences of the poor organization of logging work sites. The short logging and hauling times at Cadino and Lavazè were the result of easy access to these sites afforded by roads crossing them. Mapping the plots and taking their structure (layers) and basal area into consideration helped to identify: i) the zones of instability where rapid intervention was necessary; and ii) the potential volumes (using base area) in order to choose the appropriate logging methods for optimum utilization. The LIFE project entitled “Mountain forests: tools for long-lasting multifunctional management” made it possible to find relatively satisfying outcomes for these six difficult work sites, by working to adapt silvicultural and logging methods very closely. For this, each case had to be analysed separately and received a specific solution. Therefore, there is no universal “recipe”. It is more a question of the general method to be applied: analysing the functions involved, the social expectations, crop status and dynamics, techno-economic constraints; defining an appropriate type of silviculture; and choosing a silvicultural/logging method combination that will be compatible with these elements. At the Italian sites, where there already was an integrated wood industry and a variety of logging techniques, the study could be concentrated on refining silvicultural methods, less extreme on the work sites studied than the edge cuttings of the even-aged high forests usually practised in the Trentin Valley. In all three cases, the balance sheet has been mostly positive. 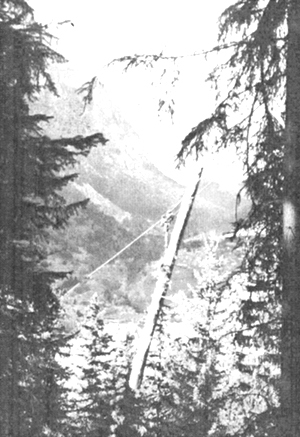 In France, “new” logging methods were promoted: more precisely, various versions of cable logging, particularly in combination with other techniques - tractor at Contamines, or helicopter at Abondance. In a context where the single-tree selection system predominates, this meant adjusting the silviculture in the direction of relatively concentrated group cuttings. These almost opposite silvicultural leanings from one country to the other do converge on an increasingly shared concept at the Alpine working circle level: a type of “cluster” silviculture that respects the natural structure of (high forest systems), or seeks to imitate it (at lower elevations) in order to achieve stability, diversity and cost-effective management. Beyond the technical aspects, the study also revealed how strong habits and regulatory frameworks can be, and how they tend to hold back progress, especially in France: habits of standing sales, long-length logging, using tractors rather than cables, subsidizing creation of roads rather than logging, the VAT system, etc. The failure at Abondance and the difficulties encountered at Pralognan also indicate obstruction at the municipal level. Municipalities are not always encouraged to manage forests in the long term. In many cases the current structures and techniques are adequate enough for shrewd and efficient management of mountain forests - but for cases that are exceptions to the rule they are insufficient. Unfortunately, such cases will become more and more frequent, as expectations are formulated better (particularly concerning protection of the environment and landscapes) and techniques multiply. Over time, the very idea of “standard” may die out. This is why we need to anticipate large-scale obstacles, such as those already experienced in Switzerland and Germany, by pursuing innovative strategies that are based on pilot work sites such as those presented here. These work sites are destined to form the basis for a techno-economic reference network for motivating socio-political thought. Imagination and initiative must be mobilized to serve forestry techniques, just as financing methods must be turned partly toward assisting “precision” logging.